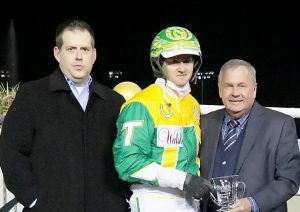 Trace Tetrick and Jeff Cullipher topped the standings once again in 2018 at Harrah’s Hoosier Park to earn the titles in driving and training, respectively. Tetrick won his fifth consecutive title overall while Cullipher won his second straight title at the conclusion of the meet Saturday, Nov. 10. Tetrick, a native of Geff, Ill., completed the season with 309 victories and more than $3.7 million in purses. He is the all-time leading driver at Harrah’s Hoosier Park and ranked seventh in North America this season in wins. He currently has 470 wins and in excess of $5.5 million for 2018. Sam Widger finished second in the standings at Harrah’s Hoosier Park with 259 victories while John DeLong was third with 248 wins. On the training side, Cullipher earned his second consecutive title in Indiana, scoring 119 victories during the 160-night meet. Cullipher’s horses accumulated in excess of $1.3 million in purses. A native of Henderson, Ky. and the son of accomplished trainer Roger Cullipher, the younger Cullipher competed at Hoosier Park during the first decade of racing before leaving the area and the business for several years. Cullipher returned in 2013 and has catapulted to national prominence. Cullipher is currently ranked 24th for wins among all trainers in North America. 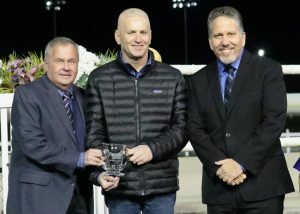 Jamie Macomber, who tied with Cullipher in 2017 for the training title, finished second with 116 wins while Shane Bowermaster, trainer for Brian Brown finished in third with 56 wins, just one ahead of Tyler George who finished fourth with 55 wins for the meet. The top horse of the meet came from George’s barn as Always A Prince topped the standings, earning 18 wins in 20 starts with purses in excess of $485,000. Custom Cantab, trained by Chris Beaver, was ranked second on the list of winning horses for 2018 with 12 wins in 16 starts and more than $429,000 in purses. The Cullipher-trained Invitational pacer Endeavor was third with 11 wins in 16 starts.